Mounted under the sub-floor boards under the front passenger seat and in front of the pump box are two tanks referred to as the service tanks. These 1-1/2 quart tanks are plumbed in series with a working pressure of 140 PSIG. The tanks are generally made from 14 gauge material. Originally drawn from brass, the tanks were made of steel by the time condensing cars were introduced since the brass tanks were found to stress crack with the constant pressure cycling. Today the tanks are available as copper reproductions since steel tanks were found to be prone to rust out due to moisture in the pressurization air condensing out and collecting in the bottom of the tanks. 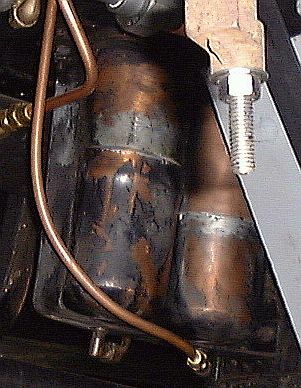 It was obvious that the original steel tanks that came on the car had failed long ago and had been replaced with the copper reproductions. A cushion of air in these tanks allow the pumps to fill the tanks with fuel while the air compresses thus building fuel pressure. Kerosene fuel is pumped into the bottom of one of tanks (right tank) while air can be admitted to the second tank (left tank). This arrangement allows the fuel pumps (hand or power) to pump fuel against the air pressure in the tanks and pressurize the burner fuel supply system. 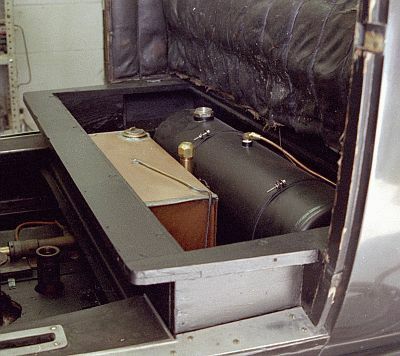 The steam cylinder oil tank is a small rectangular copper tank under the front driver and passenger seat. This is the sole tank that was not only in original condition but was also in nearly mint condition. While a steam heating loop had been added sometime in the past and then disconnected, this tank did not leak and was in serviceable condition. The only work done to this tank was to remove it, drain it of steam cylinder oil, and to clean it internally to insure the wire screen covering the oil line to the steam cylinder oil pump was clear of debris. The black replacement pilot fuel tank is mounted adjacent the steam cylinder oil tank.